Hyderabad, Telangana, India (12 June 2014): As part of its corporate social responsibility (CSR) activities, the Rural Electrification Corporation Limited (RECL) has partnered with ICRISAT to improve the livelihoods of smallholder farmers by adopting a science-led integrated watershed development approach. The initiative “Farmer-centric Integrated Watershed Management for Improving Rural Livelihoods” will benefit more than 10,000 families in Mahabubnagar district of Telangana State and Anantapur district of Andhra Pradesh, covering a total area of about 11,000 hectares. This initiative will be spearheaded by the ICRISAT Development Center (IDC) headed by Dr Suhas P Wani. The major thrust of the project will be on conserving rainwater and augmenting the groundwater and surface water resources in the watershed and efficient use of land and water resources through improved and sustainable management of natural resources. “This is a novel CSR initiative being taken up for the first time to benefit small and marginal farmers. We will employ all the necessary expertise and technical help to ensure the success of the project,” said Dr William D Dar, Director General, ICRISAT. The major activities under this initiative include: rainwater harvesting, soil and moisture conservation, reuse of domestic water, selection of appropriate crops based on market demand, growing forage for livestock and rehabilitation of wastelands. Training and capacity building of local community members and institution building for long-term sustainability will be important cross-cutting activities. IDC undertakes large scaling-up/out of ICRISAT’s science-backed technologies to achieve major impacts. It aims to help fulfill ICRISAT’s mission – to reduce poverty, hunger, malnutrition and environmental degradation in the dryland tropics. 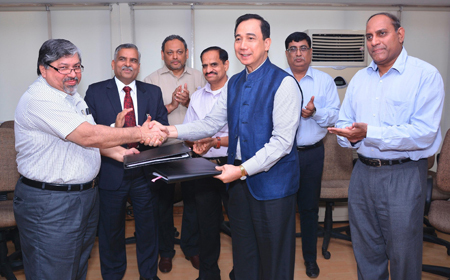 The Memorandum of Understanding was signed in New Delhi on 29 May in the presence of senior officials of ICRISAT and RECL.